(Nanowerk News) Researchers at the University of Delaware have discovered unique behaviors of hydroxyapatite nanoparticles (HANPs) that show promise as a phosphorus nanofertilizer and could be used to help slow the release of phosphorous in soils ("Effect of Size-Selective Retention on the Cotransport of Hydroxyapatite and Goethite Nanoparticles in Saturated Porous Media"). This would both increase phosphorous uptake efficiencies in the growing of plants and also in protecting environmentally sensitive sites, including bodies of water, by reducing nutrient loading, which is important because phosphorous is a nonrenewable resource and an essential nutrient for agricultural production. Funded by the United States Department of Agriculture (USDA), the research was conducted by Dengjun Wang, a postdoctoral researcher in the Department of Plant and Soil Sciences in UD’s College of Agriculture and Natural Resources; Yan Jin, professor of plant and soil sciences with a joint appointment in the Department of Civil and Environmental Engineering; and Deb Jaisi, assistant professor of plant and soil sciences with a joint appointment in the Department of Geological Sciences. 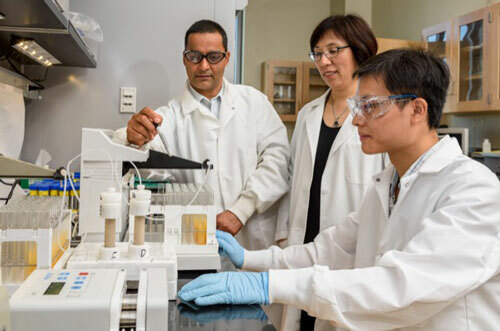 UD researchers (from left) Deb Jaisi, Yan Jin and Dengjun Wang have discovered unique behaviors of hydroxyapatite nanoparticles that show promise as a phosphorus nanofertilizer and could be used to help slow the release of phosphorous in soils. The HANPs are known as a strong sorbent for contaminants such as heavy metals and radionuclides and are already being used to remediate soils, sediments and ground waters. However, its potential as a better phosphorous fertilizer in agriculture has just started to be fully explored, the researchers said. The nanoparticle-based fertilizer has three major advantages over conventional phosphorous fertilizers in that it does not release phosphorous as quickly as the conventional fertilizers, it does not change soil pH upon phosphorous release and the loss of phosphorous from soil is low. The slow and steady release of phosphorous allows plants to continuously take up the nutrient as they grow. Jaisi said that the way phosphorous is currently applied to soils in fertilizer is like someone taking a glucose tablet as opposed to receiving it through an IV drip. While a commercial phosphorous fertilizer hits the soil all at once and does not allow sufficient time for plant uptake, resulting in phosphorous loss in runoff or by leaching, the HANPs provide a slow release of phosphorous for an extended period of time. As the demand to provide food for a growing population has increased, so has the application of phosphorous fertilizers, which has led to phosphorous loss from agricultural soils to open waters and has caused eutrophication in environmentally sensitive areas like the Chesapeake Bay. With the ability of HANPs to release phosphorous slowly, the nanoparticles could prove to be environmentally beneficial by reducing phosphorous loss to open waters. “You can minimize that risk and at the same time, increase the availability of phosphorous for a longer period of time during plant growth,” said Jin. Wang said the HANPs have low mobility, and the presence of other nanoparticles in the soil, such as positively charged iron oxides that are ubiquitous in soil and other subsurface environments, would fix themselves to the negatively charged HANP particles and slow down their movement. Jin explained that in order for plants to take up the phosphorous from HANPs, it needs to be released from the nanoparticles. “When plants grow, they continuously release different types of low molecular weight organic acids such as oxalic acid and citric acid. The acids that get into the soil will interact with those particles so that phosphorous can be released and be taken up by plants,” said Jin. In reaching their conclusions, the team examined how HANPs interact with a naturally occurring goethite nanoparticles (GNPs), a common iron oxide in soils, to investigate the co-transport and retention of HANPs and GNPs in water-saturated sand columns under environmentally relevant transport conditions. Wang said that the nanoparticle with which the group works is very small, ranging from one nanometer to 100 nanometers, with one nanometer being about 10,000 times smaller than the diameter of a human hair. “These very tiny particles have large specific surface areas and high reactivity; they are quite fantastic to a variety of applications in various fields, including agriculture,” he said.